Christmas is just around the corner and the demand for an electric scooter for kids is undeniably on the rise again. Kids, even as young as 5 years old, are now getting keen on owning an electric scooter or any ride-on toy. Many parents, however, are wondering as to what is the right age to purchase electric scooter for kids. With the different innovation and safety features added to many mobility toys, is it now safe to purchase an electric scooter for kids? The question also raises a big concern for many consumers who are worried about accidents or any injuries related to electronic rides. To address such concern, the US Consumer Product Safety Commission’s have released its own guideline pertaining to the determination of the right ride-on toy for children based on their age and behavior. Firstly, one of the main factors emphasized in the guideline on choosing electric scooter for kids is the balance. Children of various age have different physical factors that can immensely affect balance. The wide spaced wheels of the electric scooters or ride-on toys can make them easier to ride. Children also tend to find and hold their balance thanks to this factor. 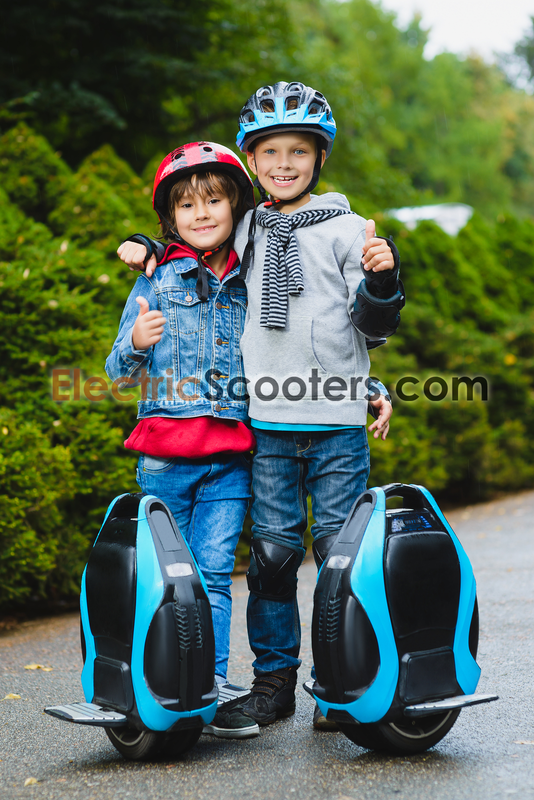 Motorized vehicles also have different speed levels, and this is one of the basic factors to check when purchasing an electric scooter for kids. In a nutshell, the higher the speed, the more physical efforts a child need to exert to maintain the balance. Aside from balance and speed, there are other-other basic factors you need to check including the size of the toy parts and how easy they can get detached, the motor skills needed to operate it, licensing (when deemed necessary), and the level of child’s realism. All of these can be determined by inspecting the electric scooter for kids you wish to purchase and by knowing well your own child’s behavior and physical capabilities. Let’s go check the summary of the guideline to understand better how to select the appropriate electric scooter for kids. Ride-on toys that can be propelled physically by their feet are the only ones recommended at this age. You may encounter little electric scooters for kids this age, but they are not advisable yet. Children who can walk straight can start using the feet-straddled ride-on toys. As per the guideline set by the US Consumer Product Safety, ride-on toys with at least four wheels should be allowed to be used by young kids of this age bracket. The toy should also be low enough so they ride it more easily. Ride-on toys with recessed wheels are also advised. These would allow them to maneuver the ride-on toy more easily. As they cannot operate electric scooters for kids yet, they would still be relying on their own strength to push their own weight around. Check the label, safety requirements, and the weight requirement of your non-electric scooter for kids before allowing your child to use them. Kids of this age are starting to get more curious and purchasing a ride-on toy with vibrant colors and designs are highly recommended. Wagons are suggested at this age and ride-on toys with storage boxes would also be helpful. Anything that can be rocked is appropriate for this age, too. Electric scooters for kids are not yet suitable for this age. However, you can find toys equipped with the motor that allow slow movement. In this case, you may opt to purchase them instead of the usual electric scooter for kids. Note, however, that adult supervision is immensely important at this point as kids still lack steering skills and control. Children at this age are starting to get interested in anything they can pedal. This is also one of the first motor skills they could learn after running and walking. Tricycles that can be pedaled are recommended at this stage. Slow-moving electric scooter for kids may also start to appeal these young toddlers and parents. They can be tried, but these children need to be under the full supervision of their parents or guardians while using them. Also, they should not be allowed to use them alone. Parents need to hold them while kids start to practice. At this age, children tend to get more interested in using the bicycle and they start to lose interest in ride-on toys. They may begin to try electric scooters for kids as long as they are slow moving and the speeds are easy to be adjusted. They start to obtain better balance and better body coordination as this age. With their level of curiosity, kids of this age also have the highest risks of obtaining injuries and falling. As with any activity, adult supervision and guidance are an absolute must. Kids truly enjoy of riding and cruising in their ride-on toys – be it a scooter, toy car, or even skateboards. However, it is important to note that even the best electric scooters for kids are neither the same nor equal. To make sure that you are getting the right electric scooter for kids, see the following and use them as a checklist. Check the Speed and Throttle. For novice riders who are below 13 years old, speed not exceeding 10 mph is advised. It is also important to train the rider on how to use the brakes and how to slow them carefully. To start the motor, parents may either choose from two options – the kick-type or the throttle start. The kick may be relatively cheaper in price, but this type could be inconvenient once your child has gotten used to the scooter already. Note that for the best electric scooters for kids, the two start modes can be found. Scrutinizing every detail and every part of the electric scooter for kids is imperative. Safety also means being able to provide all the necessary safety gear. Examples of these are the helmet, knee pads, eye protection to elbow pads. Better check the manufacturer of your own list electric scooters for kids and see some reviews about them. Note that part of the safety requirement is also following the age requirement as prescribed by both the manufacturer and the Commission. Another key feature you need to check is how long the battery last per full charge. Note that despite being prudent with the use of electric scooters, the quality of battery may still deteriorate over time. Therefore, storing and recharging them properly are a must. In line with this, you need to check the double check, the batteries and see if you could easily find replacements when deemed necessary. The best electric scooters for kids should be able to run at least 30 minutes. Checking the tires is important. You man want yo find scooters with larger wheels and that are made of rubber so they can glide smoothly on the surface. The seat should also be adjustable. It is likewise imperative to check the wires, batteries, brakes, and other tools that come with it. You also need to purchase the electric scooter that is just big enough for your child. The best scooters for kids also come with accessories that are extra useful for young users. Most of the time, although not always, the cost of the electric scooter can also give a hint on the quality you can expect from it. Generally, best electric scooters for kids are slightly more expensive than most models available on the market. The brand also dictates the cost of the unit. Knowing these guidelines can immensely help you find the right electric scooter for kids based on their age, behavior, and preferences.